Remember that famous “pooh pooh bee doo!” tune that Marilyn Monroe sang? Well, seems like designers suddenly missed a little of a “jazz” touch and started to sing along. It would’ve been a mistake to say some like it hot, this coming spring season everybody likes it hot without exception! Crazy, golden, roaring finally! And it is all about the twenties that represented the decade of great changes in everything: female ideology, life and look subsequently. Fashion of those years became such a peculiar representation of idiomatic hysteria and fever the girls suddenly got in the end of the WWI. Those hard years had a great influence on a woman’s life and clothes. The way she dressed before appeared to be just not acceptable during the wartime. Comfort was the most important thing because she had to serve like a man. Women took care of the wounded soldiers in the hospitals, worked hard on the factories ignoring their feminine essence. They just did not have a choice. This is actually the period when people started to wear that very incredibly beloved and well known nowadays “trench coat” that Thomas Burberry created for the British army uniforms . It turned into female postwar daily life clothes later. And finally peacetime period proved that there was no turning back to an old style wardrobe as well as to the life that reigned before. No more massacre and disruption, it’s time to have some fun they claimed and so such sort of a postwar relief was marked with emergence of so called “flappers”. Actually this word may be defined as a “young bird flapping its wings while learning to fly” but this is only one of many other meanings of this sobriquet. Young, spontaneous and unencumbered, these self-confident new breed girls rather gravitated toward breaking the rules side. This mass outbreak expressed the total disagreement and contradiction to everything that was accepted in society. It looked more like a sudden manifestation whether due to the fact they obtained the right to vote and already mastered the male labor or simply because the previous boredom of ambiance they had to overcome. They finally got a choice! Very likely these flapper girls looked explicitly fatuous and provocative: heavily lined-up eyes, clearly defined eyebrows arches, fatal dark-red lips, garish rouge, hemline below the knee length and couple of necklaces of pearls created this whole languishing nonchalant look. It was no longer a shock if a girl took her beautician out the bag to fix her make up for all to see. She appeared to be frankly liberated, she smoked, drove cars, drank in a line with men, flirted and amused with them. Jazz was considered as scandal music and its spirit responded to the mood of this total frivolousness in everything. Girls began to attend loud parties where they let the men pet them and danced foxtrot and charleston till the morning lights. It was a huge revolution that caused this society alteration. 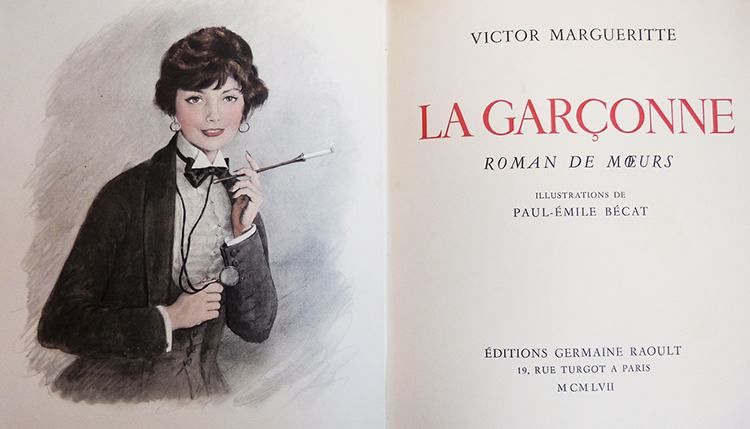 The scandalously famous avant-garde novel called “La Garçonne” by Victor Margueritte clearly defined the precise tendency according to the dress code of postwar time. 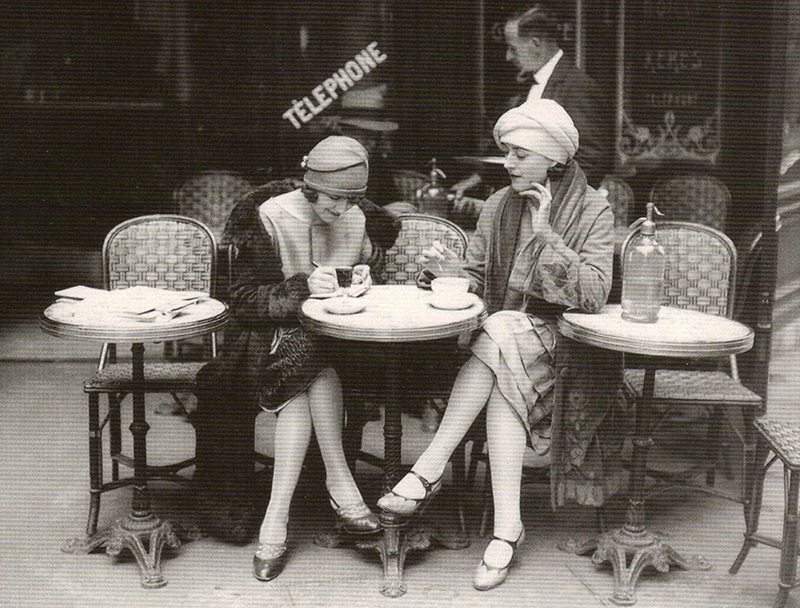 The story’s main character Monique dressed like a boy, had a bob haircut and led dissolute life style…just like every other “flapper” woman did. It became fashionable to smoke cigarettes in long mouthpieces that added such an eccentric look to her image; she denied hourglass feminine shape but rather preferred flat chest, narrow hips, long arms and legs that made her look like a boy. Her shoulders-to-knees length dress acquired such a distinguishing “pipe” shape that became very fashionable silhouette. Although there was no waist emphasis she did not forget to denude her back to the bitter end. This appeared to be a perfect party look. 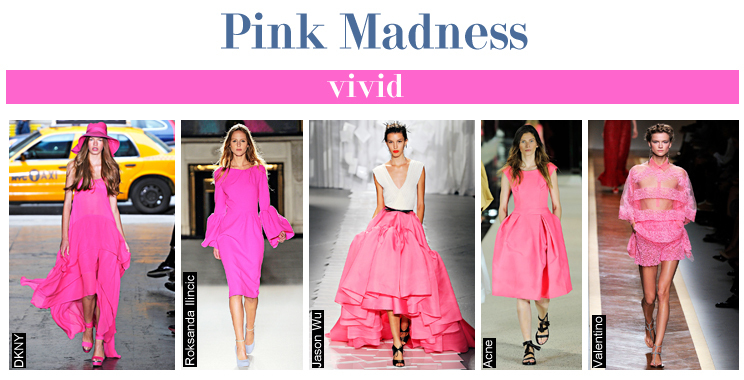 The new collections that were shown in September during spring/summer 2012 fashion weeks definitely reflected those lickety-split times in fashion and mood. Surely the tempestuous events that occurred during 20’s were displayed in the most favorite movies long before today’s trends. Seems like the designers suddenly inspired by the looks of the protagonists. Look at the Ralph Lauren’s and Marc Jacobs’ attires? Does it look familiar? No doubt, it does! It seems like Daphne and Josephine from “Some like it hot” revived again and they walk the runways all over the fashion capitals. Those romantic silk blouses, pastel cardigans and skirts totally reminded that you may appear to be such a gorgeous modern Daisy Buchanan from “the Great Gatsby” movie too. All the textures, colors and prints bring all the vintage style back. Tory Burch reminded to all the fashionistas how exactly the original sportswear looks like and it is absolutely not what we got used to call “sportswear” today. In fact this comprehensive return of the roaring 20’s fashion apparently recalls the destruction of stereotypes. Rebellious spirit of those years reminds us to not be afraid of losing fetters of some specified scope that constrains our latitude. So let it go and dance! It’s a roar, Sugar! Frida Giannini created gorgeous Art Deco black-and-gold fringed flapper dresses just like the one that Berenice Bejo wears in the “The Artist”. This French romance film tells the Hollywood story that occurred between 1927 and 1932. 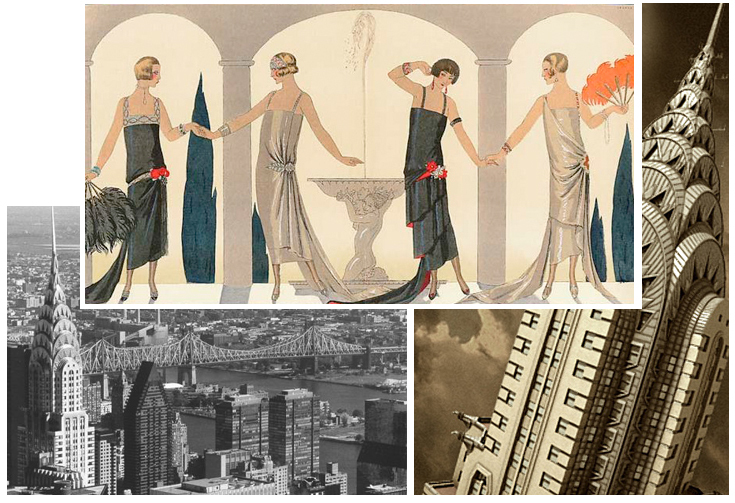 New eclectic style that prevailed during the 20’s manifested in architecture, painting and certainly fashion. It combined modern, Russian constructivism, abstraction, cubism, ethnic and geometric patterns and provided designers with such an incredible heritage. These dropped-waist Gucci dresses with a beautiful streamy fringe are the great illustrations of the foregoing direction in art. It’s important to admit that the fringe became the widely used detail by many designers. Chanel said that true elegance always suggests the possibility of unhindered movement. Little Black Dress that she devised in 1926 was not the only one prove of these words. Androgynous shape of a female body and the tendency to lead the diet caused the need to elaborate new nice suit for sport activities for women who are all into sport but still want to look beautiful. Doll – a charming, humble, fascinating. She’s a pretty little thing. Some would probably assume there is no perfection among the real people but these gorgeous cuties are the very embodiments of the beauty standards. These beautiful babes have such enchanting dresses that fit them crazy. Do you want what they wear? It’s enough of being a tailor who’s been making up these dollish outfits the whole childhood. Bows, hairpins, lace, ribbons, floating fabrics and puppet cuts, it’s just a dream of a little miss from the past came true. A little dollhouse suddenly came to life and you are the main part of it! The Louis Vuitton fashion show was simply amazing. It was a literally total merry-go-round of the innocent clothes circling all around, unconditionally appeared to be the best of the best. Such a wonderful complement as shiny tiaras or elegant hoops will add a “princess” look to the image. Mulberry laid the hair of the models so pompously and boldly, just like Viktor and Rolf did…but to eyelashes. It added a wide open glance to this angel face that looks so sincerely and playful. John Galliano and Sacai choose rather a sort of an intelligent and “good girl” character, so their dolls are top-drawer delegates. It never hurts to play a little so what’s in your puppet wardrobe? They say that everything in this world is the one. Well, this statement definitely makes sense. Winter as well as summer season is all about freshness and water in one of its possible conditions. It’s all so tempting to think that one day all of it will melt away and bring you to the place where these designations are still applicable. And this time is coming soon, so don’t hesitate to suddenly get carried away into the enthralling dreams. Ever since all the designers insist on it no need to wait for any even more appropriate occasion than this. They all enforce you to get into the blue right now. 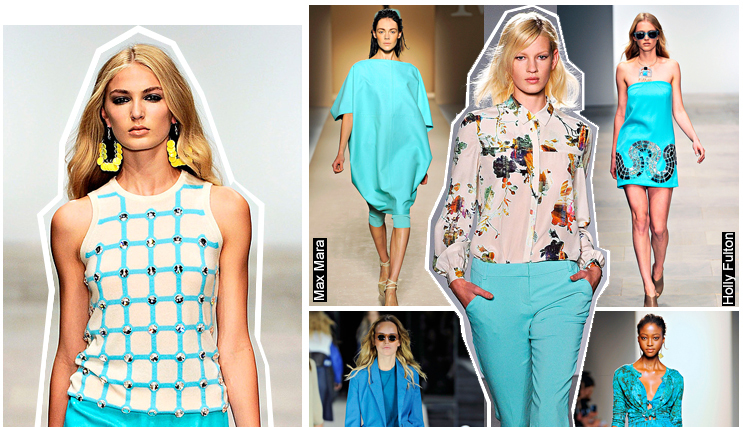 All spring collections literally replete with the blue colors that could ever exist. 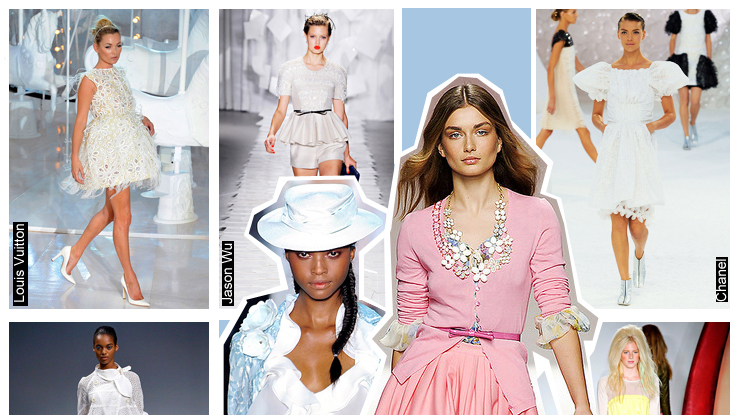 Sky blue, azure, turquoise, aquamarine, all of these stunning shadows filled the runways. It’s nothing but an underwater world with its inhabitants, entourage and ambience. Lips, hair, headwear! It just gotta have a blue tone. No detail was missed. 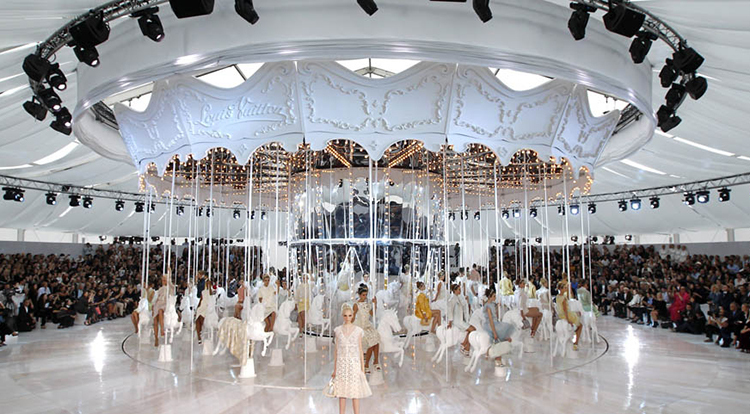 It’s no surprise that Chanel fashion show is always something out of the ordinary but this time it totally exceeded all expectations. It seems as Karl will never get tired of surpassing himself over and over again. This time it emerged as a white realm of sea creatures. All of them were there: sea horses, giant shells, seaweed. Even spines of the models were embellished with an elegant thin filament of pearls. Lovely and charming, isn’t it? Sea shells bags look simply spectacular. Give your hair a wet effect and you are the protectress of the maritime vastness. Donatella Versace presented a collection with the inherent degree of sexiness. Her sparkly and strapless dresses in gorgeous pastel colors were breathtaking. Those illuminated squares that models walked added even more glow to the galore of shimmer and shine. With all the wonderful collections that designers presented you may fall into your blue dream right away. It is all so natural and fresh and does not take much. Very soon the shores will provide you with all the necessary accessories and sea give the total attire. Tune into the wave and get your mermaid outfit ready!